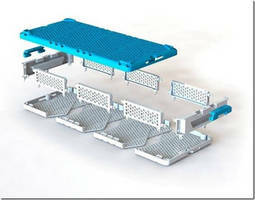 ALPHARETTA, Ga. -- Solvay Specialty Polymers has contracted with polymer design, engineering, and injection molding firm Promolding BV, the Netherlands, to generate several original design concepts for the manufacturing of sterilization instrument cases and trays using Radel® polyphenylsulfone (PPSU) resin instead of stainless steel or aluminum. These concepts were unveiled March 21 at the American Academy of Orthopedic Surgeons (AAOS) in Chicago and are being shared globally with case and tray manufacturers and medical OEMs. The first concept takes advantage of the cost efficiencies of injection molding versus thermoforming, which has been the standard manufacturing method for this application since the mid-1990s. Responding to growing cost pressures from medical OEMs, this injection molding concept uses just five molded components to build full DIN, ¾ DIN, or ½ DIN cases. High hole count, which is facilitated by injection molding and difficult to achieve after thermoforming, reduces surface area to avoid wet-pack and further lowers overall case weight versus metal. Snap-fit features allow quick assembly, and unlike thermoforming, a matte surface finish can be readily achieved to reduce glare from operating room lights. The use of colored resins allows for branding opportunities without the added cost of anodizing metal, and material transparency offers another design option. The second concept offers an innovative strategy for positioning and securing instruments in the inner tray. Instruments are first laid in a pin-bed for positioning. The surface topography is then computer scanned and replicated using automated CNC equipment onto the surface of a honeycomb insert which has been molded or extruded from Radel® PPSU. The honeycomb structure provides exceptional strength in the vertical direction for supporting large instruments, while inserts with varying cell sizes can be used to accommodate smaller instruments. This system speeds time-to-market after instrument design is complete, with future instrument modifications easily incorporated without the need to reconfigure brackets or rebuild the tool. Radel® PPSU is the material of choice for sterilization cases and trays because of its toughness, excellent chemical resistance, and ability to withstand repeated disinfection and autoclaving - over 1,000 cycles - while maintaining its toughness and impact resistance. Solvay Specialty Polymers has been granted design protection for these concepts in North America, Europe, and China, thus allowing customers to use Radel® PPSU in these designs at no charge. Solvay Specialty Polymers is a global leader in the development of sulfone polymer technology, launching Udel® polysulfone nearly 45 years ago. In addition, Solvay’s experience as a key materials supplier in the healthcare field spans more than 20 years. The company is a leading manufacturer of high-performance plastics, offering a broad range of materials for healthcare instruments and medical devices. More recently, Solvay has successfully introduced its line of Solviva® Biomaterials and offers them for use in a range of implantable devices. Promolding was founded in 1997 in the former Fokker-factory at Ypenburg (The Hague, NL). The company’s mission is to translate high-performance polymer technology into industrial products for medical, aerospace, and high technology markets, striving for maximum functional usage of materials, a low CO2 footprint and recyclability. Promolding has recently worked with Aerocat B.V, the Netherlands, to develop a revolutionary new catering trolley concept using Radel® PPSU to replace metal, which received several nominations for industry design awards. For more information, visit www.promolding.nl. Solvay Specialty Polymers is a leading global supplier of high-performance thermoplastics for implantable and non-implantable medical devices. The company has expanded its focus on the healthcare industry to meet the growing needs of its global customers. Solvay is building on its 20-year history as a key material supplier in the healthcare field, devoting considerable new resources to help customers be more efficient and cut costs. Metal-to-plastic replacement remains a key focus for manufacturers, but increased cost pressures pose a new challenge as the market continues to grow at a double-digit pace. Solvay also continues to devote considerable research and development activities to polymer technology and commercialization of new and unique material options for medical OEMs and processors. Solvay Specialty Polymers manufactures over 1500 products across 35 brands of high-performance polymers - fluoropolymers, fluoroelastomers, fluorinated fluids, semi-aromatic polyamides, sulfone polymers, aromatic ultra polymers, high-barrier polymers and cross-linked high-performance compounds - for use in Aerospace, Alternative Energy, Automotive, Healthcare, Membranes, Oil and Gas, Packaging, Plumbing, Semiconductors, Wire and Cable, and other industries. Learn more at www.solvay.com.